What’s? – H.A.P | G-GOTOH Ltd.
What’s? – About Gotoh HAP. 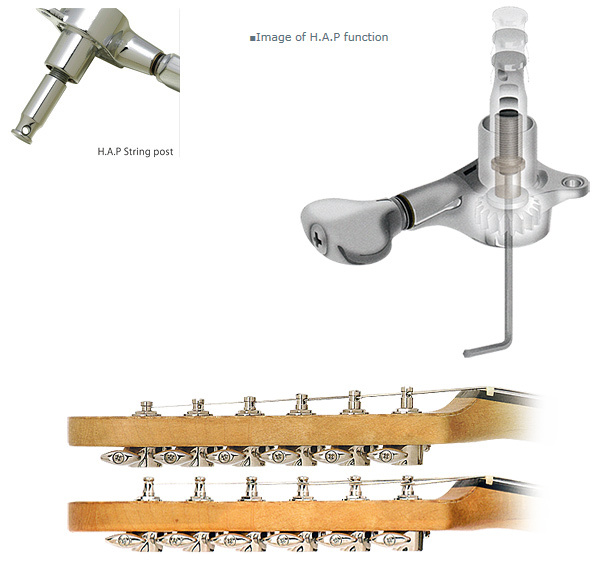 HAP models are prepared for all of SG/SD guitar peg series. HAP is designed for a lower-positioned post, compared with a standard post. HAPA is designed for a higher-positioned post, compared with a standard post. Please refer to the measurements of each model indicated in a catalog to find each moving part. *HAP/HAPA can be customized as orders are received, same as buttons and colors. Gotoh SG-Series and SD-Series feature Rock-Solid™ string post (except for a few models) and have 5 kinds of post variation, Standard, Magnum Lock(MG)®, H.A.P®and H.A.P.M which you can choose. It gives unrivalled tuning stability for Vibrato equipped guitars. Gotohs advanced technology and developing spirit have greatly won the confidence of many giitar builders in the world. H.A.P.® [Height Adjustable Post] PAT. Creating the perfect down pressure over a guitars nut is a complex balance between Headstock angle and Tuning machine head post height selection. Height adjustable posts take away tha guesswork by allowing you to dial in the exact angle you need for, friction, string pressure / tension and open string sound and sustain. Ideal for flat style peg heads when string trees need to be eliminated.